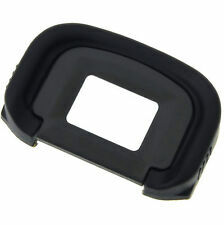 Eye Cup Eyecup Eyepiece EB for Canon EOS 5d Mark 2 40d 60d 6d 70d. UK Stock. Canon EOS 5D 5D Mark II 6D 10D 20D 30D 40D 50D 60D 60Da 70D. It replaces for CANON Eyecup EB. EOS A2 A2E D30 D60. ELAN II IIE. Rubber eyepiece increases viewing comfort and prevents the display light input. Suitable Device Type: FOR Canon 550D/300D/350D/400D/60D/600D/500D/450D/1000D/D30. Canon EOS 80D, 70D, 60D, 60Da, 50D, 40D, 30D, 20Da, 20D, 10D, 6D, 5D, 5D Mark II, D30, D60, Digital Rebel, Elan II/IIE, Rebel 2000, Rebel GII, Rebel T2, Rebel X, Rebel XS. EB-type Rubber Eyepiece for Canon Eye Cup Eyecup. 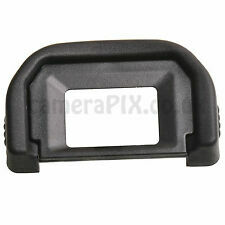 This Eyecup is a repalced one for CANON EF Eyecup. 1PC For Canon EF Eyecup. For CANON EOS 350D. For CANON EOS 400D. For CANON EOS 450D. For CANON EOS 550D. For CANON EOS 500D. For CANON EOS 600D. Canon EOS 800D 760D 750D 700D 1300D 1200D 1100D 1000D 650D 600D 550D 500D 450D 400D 350D 300D 200D 100D 300X 300V 3000V 8000D. 1 x Rubber Eyepiece Eyecup EF. Note: The Eyecup is not produced by Canon but the quality as good as the Canons' original goods. 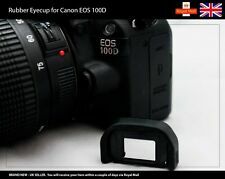 Canon EOS 1200D/ 1100D/ 1000D/ 100D/ 700D/ 650D/ 600D/ 550D/ 500D/ 450D/ 400D. 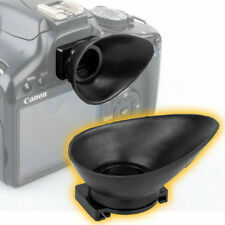 EF-type Rubber Eyepiece for Canon Eye Cup Eyecup. Note: The Eyecup is not produce by Canon but the quality as good as the Canon's original goods. EOS 760D, 8000D, EOS 1100D, EOS 1200D, EOS 1300D. JJC EC-7 Eye Cup for Canon x 1. EOS 6D, EOS 60Da, EOS 70D, EOS 80D, EOS 100D. Canon EOS 5D Mark II, 5D, 6D Mark II, 60D, 50D, 40D. The Eyepiece is designed to seal out stray light for improved viewfinder optics. Canon EOS 1200D, 1100D, 1000D, 750D, 700D, 760D, 650D, 600D, 550D, 500D, 450D, 400D, 350D, 3000V, 100D. Note: The Eyecup is not produce by Canon but the quality as good as the Canon's original goods. EOS 10D, EOS 20D, EOS 20Da, EOS 30D, EOS 40D, EOS 50D, EOS 5D, EOS 5D Mark II, EOS 60D, EOS A2, EOS A2E, EOS D30, EOS D60. Note: The Eyecup is not produced by Canon but the quality as good as the Canon's original goods. 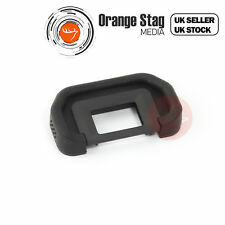 4.5 out of 5 stars - Eye Cup Eyecup Eyepiece EB for Canon EOS 5D MARK 2, 40D 60D 6D 70D. UK Stock. 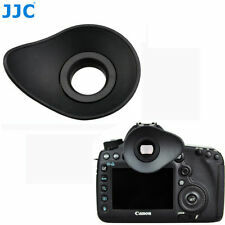 6 product ratings6 product ratings - Eye Cup Eyecup Eyepiece EB for Canon EOS 5D MARK 2, 40D 60D 6D 70D. UK Stock. 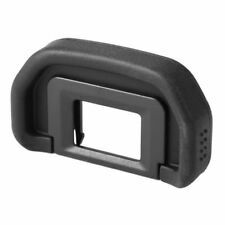 This Eyecup for Canon replaces your lost, damaged or broken eyepiece Canon EF rubber eyecup improves viewing comfort and prevents stray light from entering the viewfinder and diminishing contrast. The Eyecup provides cushioning around the camera's eyepiece,and is especially useful to eyeglass wearers Attaches to the viewfinder eyepiece minimizing extraneous light and vision fatigue Two small clips on the back secures the eyepiece onto your camera Compatible with: CANON EOS 300D CANON EOS 350D CANON EOS 400D CANON EOS 450D CANON EOS 500D CANON EOS 550D CANON EOS 600D CANON EOS 1000D/1100D/700D/100D CANON Digital Rebel XSi， XTi，XS package：5pcs. Compatible with Canon EOS 450D 500D 550D 600D 650D 1000D etc. Material: Rubber Plastic. Compatible with Canon EOS 450D 500D 550D 600D 650D 1000D etc. Material: Rubber Plastic. Quantity: 5. Compatible with CANON EOS 300D, EOS 350D, EOS 400D, EOS 450D, EOS 500D, EOS 550D, EOS 600D, EOS 1000D, 1100D, 700D, 100D, Digital Rebel XSi, XTi, XS. Attaches to the viewfinder eyepiece minimizing extraneous light and vision fatigue. Canon EOS 60Da 60D 50D 40D 30D 20Da 20D 10D 6D 5D Mk II 5D D60 D30. Quantity: 5. Compatible with Material: Rubber Plastic. 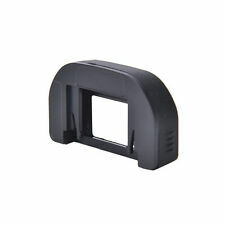 Genuine Canon Ef Eyecup dSLR for EOS Rebel XT XTi Xs XSi T1i K2 T2 T2i T3 T3i. Box Contains 1 x Eyecup EF. We will always help you to have a 100% positive happy buying experience. 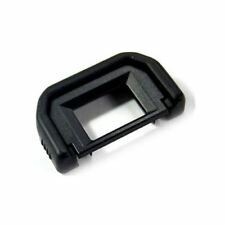 18mm Eyepiece Eyecup Eye Cup for Canon EOS 650D 700D 100D 70D 1200D 600D 5D II. Such as Canon EOS 650D 700D 100D 70D 1200D 60D 600D. Attaches to the viewfinder eyepiece minimizing extraneous light and vision fatigue. Security & Safety. Personal Safety. Product Information. Xbox One & 360. Your order SORRY, Personal collection not available. United Kingdom Personal Collection. 1st item £3.95. USB - Mustek. Kiss X9i Kiss X8i Kiss X7i Kiss X6i KissX5 KissX4 KissX3 KissX2 KissDX KissDN KissX50 Kiss X70 KissF. EOS 760D 750D 700D 1300D 1200D 1100D 1000D 650D 600D 550D 500D 450D 400D 350D 300D 100D 300X 300V 3000V. For EOS 300D 350D 400D 450D 500D 550D 600D 650D 700D 1100D 1000D 100D. 1 x Eyecup for Canon 18mm. Attaches to the viewfinder eyepiece minimizing extraneous light and vision fatigue. for EOS Rebel 2000, for EOS Rebel G, for EOS Rebel GIIEOS Rebel X, for EOS Rebel, for EOS Rebel xt, for xti, for xs, for xsi, for T1i T2i T3 T3i T4i T5i. Canon EOS 70D, 80D, 60D, 60Da, 50D, 40D, 30D, 20Da, 20D, 10D, 6D, 5D, 5D Mark II, D30, D60, Digital Rebel, Elan II/IIE, Rebel 2000, Rebel GII, Rebel T2, Rebel X, Rebel XS. Note: The Eyecup is not produced by Canon but the quality as good as the Canon's original goods. Canon EOS 7D Body. Canon EOS 5D Mark Ill. EG eye piece. Canon EOS-1D Mark IV. Canon EOS-1D Mark III. Refer to your Canon’s user manual or manufacturer to ensure compatibility. Canon EOS-1Ds Mark III. Canon EOS-1DX. This third-party eyecup replaces the Canon Eyecup - Ef and is compatible with the following Canon EOS models 1100D Rebel T3 / Kiss X50. 1000D / Rebel XS / Kiss F. hope you could understand. Model Show. Canon EOS 80D, 70D, 60D, 60Da, 50D, 40D, 30D, 20Da, 20D, 10D. Note: The Eyecup is not produced by Canon but the quality as good as the Canon's original goods. 1 x EB Eyecup. EOS 6D, 5D, 5D Mark II. Digital Rebel, EOS Elan II, EOS ELAN IIE, Rebel 2000, Rebel G, Rebel GII, Rebel K2, Rebel TI, Rebel T2, Rebel X, Rebel XS. Canon: 650D 600D 550D 500D 450D 1100D 1000D 400D 350D. 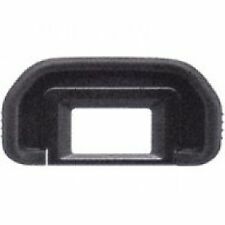 1 x Eyecup for Canon. Refer to your Canon's user manual or manufacturer to ensure compatibility. Features a soft outer edge rubber cushion. The product is suitable for the professional technicians. You can even view it with your glasses on. Note: The Eyecup is not produced by Canon but the quality as good as the Canons' original goods. Eyecup (EF-type). Canon EOS 1200D/1100D/1000D/100D/700D/650D/600D/550D/500D/450D/400D Canon Rebel t5/t3/. Altura Photo Rubber Eyepiece Eyecup for CANON Rebel (T5i T4i T3i T3 T2i T1i XTi XSi XS), CANON EOS (1100D 700D 650D 600D 550D 500D 450D 400D 300D). 1 x Rubber Eyepiece Eyecup. Comfortable ergonomic rubber design. Canon EOS 700D 100D 1200D 1100D 300D 350D 400D 450D 500D 550D 600D 650D 100D etc. EyeCup As Canon EF × 1. Suitable For. EOS 550D, 500D, 450D, 400D, 350D, 300D, 1000D. Digital Rebel XT, XTi, XSi T1i, T2i, XS. EOS Rebel K2, T2, Ti. Refer to your Canon’s user manual or manufacturer to ensure compatibility. EF-C eye piece. 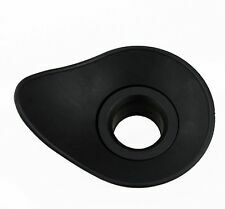 EG-type Rubber Eyepiece for Canon Eye Cup Eyecup. Note: The Eyecup is not produce by Canon but the quality as good as the Canon's original goods. Canon EOS 1D Mark IV. Canon EOS 7D. Canon EOS 1D Mark III. This third-party eyecup replaces the Canon Eyecup - EF and is compatible with the following Canon EOS models 650D / Rebel T4i / Kiss X6i. 550D / Rebel T2i / Kiss X4. 1000D / Rebel XS / Kiss F. 600D / Rebel T3i / Kiss X5. Canon EOS 800D 760D 750D 700D 1300D 1200D 1100D 1000D 650D 600D 550D 500D 450D 400D 350D 300D 200D 100D 300X 300V 3000V 8000D. Note: The Eyecup is not produced by Canon but the quality as good as the Canons' original goods. 1 x Eyecup. EOS 500D/1000D/450D/400D/350D/300D. EOS Rebel XS, Rebel XSi, Rebel XTi, Rebel XT, Rebel. EOS Kiss F, Kiss X2, Kiss Digital X, Kiss Digital N, Kiss Digital. EOS 300X, 300V. EOS Rebel K2, T2, Ti. 2xEF Eyecup Eyepiece for Canon DSLR EOS 1000D 550D 500D 450D 650D View Finder. Protects Viewfinder from Dirt and Debris. For CANON EOS 300D. For CANON EOS 350D. For CANON EOS 400D. For CANON EOS 450D. Suitable for Canon EOS 5DIII/1DX/7D/7DII /1DX/1DS MarkIII/1D MarkIII/1D MarkIV. This eye cup can protect your lens from dust, scratches, water, etc. The eye cup is made of quality plastic material, and durable. £ 12.99Buy It Now. USB - Konica. £ 29.95Buy It Now. USB - OTHER not listed. £ 12.92Buy It Now. USB - Vivitar. PROMO £ 79.92Buy It Now. £ 14.95Buy It Now. Canon EOS 550D/500D/450D/1000D/400D/350D/300D/300X/300V/3000V. Canon EOS 760D / 750D / 700D / 650D / 600D / 550D / 500D / 450D / 100D / 1200D / 1100D / 1000D. 18mm Eyecup for Canon x 1. It is not manufactured by Canon but it is the appropriate and economical solution for the problems you raise from the light. Hoodman HoodEYE for Canon EOS DSLRs. 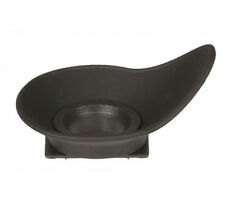 Greatly improve your viewfinder image by using this professional rubber eyecup from Hoodman. In bright light, your viewfinder image can appear very dim due to excess light entering the viewfinder. HEYENRG H-EYEN22S HEYENSG H-EYEC18 HEYEC18G H-EYEC22 HEYEC22G H-EYEC18L HEYEC18LG HEYES. The Hoodman H-EYEC18G Hoodeye eyecup for most Canon SLR and DSLR models is specially designed for the eyeglass wearer. Features:This Eyecup for Canon replaces your lost, damaged or broken eyepiece.For a more comfortable fit, replace the original one with this rubber eyecup.Attaches to the viewfinder eyepiece minimizing extraneous light and vision fatigue.The Eyecup provides cushioning around the camera's eyepiece, and is especially useful to eyeglass wearers.Rubber eyecup improves viewing comfort and prevents stray light from entering the viewfinder and diminishing contrast.Accessory ONLY, camera is not includedDescription:Comparible:for Canon EOS 5D Mark IIIfor Canon EOS 7D Bodyfor Canon EOS-1Ds Mark III/ 1D XSupport for : canon eyecup EGSpecifications:Material: RubberColor: BlackOverall Dimensions: 54mm x 33mmPackage includes:1 * Eyecup for canon . Hoodman Eye Cup H-EYEC22. for Canon 1D MARK III & 1DS MARK III 7D and Mark 1V. D2 D600 20D 1Ds Mk III 5D. D800 D50 1Ds Mk II. D2X D300, D300s 30D 7D 5D Mk II. D1 D610 10D 1D MkIII 6D. D3 D200 40D 1D Mk IV Rebel T3 / 1100D. Eyecups for Canon EOS cameras are available in a number of different formats. One such eyecup is the Hoodman HE 22 Rubber Eyecup for the Canon EOS 7D, 5D MkIII, and 1D series of cameras. This is the HoodEye eyecup and is a great way to prevent ambient light entering your viewfinder. You simply remove the camera's eyepiece and substitute the HoodEye to improve the clarity of your viewfinder. Note that this is camera specific and it will not fit the EOS 5D or 5D MkII cameras. Another of the camera eyecups for the Canon EOS series is the Pro rubber eyecup eyepiece EB for the Canon EOS 1000D, 450D, 400D, and 350D cameras. This has a soft outer edge rubber cushion and two small clips to attach it to the camera . It is much more comfortable than the original one and minimises extra light entering the viewfinder and diminishing contrast, and also minimises vision fatigue. It provides extreme viewing comfort and is particularly useful for photographers who wear glasses. Also offered among camera eyecups for canon EOS cameras is the EF type eyecup eyepiece for the Canon EOS cameras 1200D, 1100D, 650D, 700D, and 450D. This eyecup is not a Canon original part but the quality is just as good as the Canon original. Another eyecup for the EOS cameras is the new eyecup eyepiece EG which is designed for the Canon EOS 1D, 5D, 7D, and 5DMkIII cameras. The Hoodman HoodEye HEYEC18L SLR camera eyecup has been designed for the Canon EOS 5D camera and is aimed at photographers who wear glasses. It has a rotating mount so that it can be turned either way to suit photographers who use either their right eye or their left eye on the viewfinder and enable them to get the shot they want. The self-locking mount slides over the eyepiece mounting rails, keeping the eyecup in place.